Coconut Dragonfruit Blondies are a tropical twist on a classic batch of blondies. The buttery bars are packed with shredded coconut and bright pink dragonfruit, giving them a wonderful look and flavor while retaining the chewy texture that blondies are known for. Dragonfruit is also known as cactus fruit, is a melon-like fruit that grows on the cactus. There are multiple varieties of cactus fruit and dragon fruit tends to be the most widely known due to its exotic, scaly look (hence the name) and its vivid magenta color. Since its texture is similar to that of a melon, fresh dragonfruit is not a great option for baking. I used freeze dried dragonfruit in this recipe because is easy to chop up and add to a recipe, bringing in some tropical dragonfruit flavor and plenty of color! You can find freeze dried dragonfruit at some specialty stores, including Trader Joe’s, and it is also available online. Once you have it, you can use it in recipes like this one, enjoy it as a snack or add it to ice tea and lemonade to give them a pink hue! The batter for the blondies is very straightforward, using melted butter and no additional leavening to create bars that are dense and chewy. They include a generous amount of sweetened, shredded coconut, which adds to the overall texture of the bars. I think that coconut pairs particularly well with dragonfruit in this recipe because it adds a subtle extra sweetness that makes the dragonfruit really pop. Make sure to crush or chop the dragonfruit into pieces no larger than a chocolate chip before stirring them into the batter. The bars will keep for a couple of days after baking when stored in an airtight container. They’re not too sweet on their own and they could be topped with a bit of frosting or glaze (coconut glaze made with a splash of coconut rum or lemon glaze with fresh lemon juice would both be good choices) if you want to dress them up. Preheat oven 350F. Lightly grease a 9×9-inch square baking pan or line with parchment paper. In a large bowl, whisk together melted butter and sugar. Blend in eggs, vanilla extract and salt. Stir in flour and shredded coconut, mixing until no streaks of dry ingredients remain, then stir in the dragonfruit until evenly distributed. Spread mixture evenly into prepared pan. Bake for 30-35 minutes, or until blondies are set and have turned golden around the edges of the pan. Allow blondies to cool completely before slicing. The post Coconut Dragonfruit Blondies appeared first on Baking Bites. MOSAIC mini food chopper with 4 Titanium Coating Blades is perfect for Chopping, Mincing and Pureeing ingredients into soups, sauces, dressings, toppings, dips & more! High-quality food grade material glass bowl 5-Cup of capacity. Ergonomic operation with one touch pulsing creates an easy to use and safe product. Versatility and time saver food chopper. Powerful 400W motor much faster than cutting by hand. Blades with titanium coating that improve theirs hardness and keep them sharp longer. Detachable blades can be used with 2 or 4 blades, allows the upper and lower blades to chop food evenly. All parts are BPA free and all detachable parts are dishwasher safe. NOTICE: DO NOT OPERATE THE CHOPPER FOR MORE THAN 15 SECOND EACH TIME. ✅ MUTIFUNCTIONAL FOOD CHOPPER – Great for chopping, blending, pureeing, mixing and mincing a variety of ingredients quickly such as onions, garlic, cheese, hams and steers, etc. ✅ SHARP AND EFFICIENT – 4 detachable Titanium coating blades allow the upper and lower blades to chop food evenly, also improve the blades hardness and keep them sharp longer. ✅ ERGONOMIC AND SAFE DESIGN – Build with a safety design, press down to start and automatically reset. Also with non-slip rubber ring for stable operation. Make this food chopper effective, user-friendly and safety. ✅ POWERFUL AND DURABLE – 300W powerful and durable motor makes it possible to grind meat in a blink. Chop vegetables in 6 seconds and chop meats in 8 seconds with lower noise. ✅ DISHWASHER CLEANING SAFE – Easy to assemble, all removable parts clean up dishwasher safe or easily by hand. This processor is compact and lightweight for easy storage. Perfect for your home use. The Cuisinart Double Belgian Waffle Maker expertly bakes two 1-inch extra-deep, restaurant-style waffles at the same time. Just add syrup or fruit and enjoy a luxurious breakfast or special dessert right at home! The easy-to-handle rotary feature flips each waffle 180 degrees to ensure even cooking on top and bottom. A 6-setting browning control knob ensures both waffles are cooked to order, from light and fluffy to crisp and brown. LED lights and audio beep tones indicate when unit is ready to cook and when waffles are done. And the nonstick coating wipes clean, providing no mess and easy cleanup, plus effortless food release. It’s the perfect gift or perfect addition to any kitchen! The voltage for this unit is 120 volts. 100% NON CORROSIVE AND HARD WEARING – Our cooking utensils are made from the highest quality materials. Food grade silicone is safe to use for any type of food – it does not react with food or beverages, or produce any hazardous fumes. As such, they are longer-lasting than other kitchen utensils. 100% HIGHEST QUALITY SILICONE – FDA-approved silicone heads cannot scratch or damage nonstick cooking pots, pans and woks like metals do. This makes them very friendly when dealing with non stick surfaces. Cooking with the non stick silicone utensils set will protect your cookware from any scratches. 100% PREMIUM WOODEN HANDEL – Pushing the boundary of modern culinary gadgets, light and renewable wooden cookware handles provide protection against rust and thawing. A utility hanging hole on each wooden handle for convenient storage organization using hooks or a wall mount. 100% HIGH HEAT RESISTANT – FDA approved and BPA free, our silicone tips are ultra heat resistant up from -40°F -446°F, you do not have to worry they will melt if you accidentally leave them in the pot for a while. Non-stick and stain-resistance attributes made for hassle-free clean up. 100% COMPLETE COOKING SET – This 11-piece kitchen utensils set will satisfy all your needs for cooking. Everyone of them has its unique use. It would be your great companion in the kitchen. Elevate your kitchen and prepare to savor these unique kitchenware as much as the food itself! The Complete Cooking for Two Cookbook (more than 250,000 copies sold) is coming out in a luxe, hardcover gift edition — perfect for engagements, weddings, and graduations. For decades, the rule of thumb for recipes has been “serves 4 to 6,” or even more, leaving small households, newlyweds, empty nesters, college students, and others stuck with days of leftovers. Who better than the test cooks at America’s Test Kitchen, to deliver the perfect solution to this problem. Part kitchen manual, part cookbook, this groundbreaking volume was the first of its kind to engineer recipes from the ground up for the two-person household. We put our kitchen expertise to work to figure out how to scale down the trickiest dishes, from soups and stews to stir-fries and lasagnas–even cakes and pies. America’s Test Kitchen takes out all the guesswork and delivers creative solutions for foolproof and delicious meals for two. This is a modern simple style multi-purpose Dish Rack. Using the standard SUS304 manufacturing, select SUS304 stainless steel equals to choose health. Strong and durable, salt spray tests more than 200 hours, with super corrosion resistance.Wear and tear, the light will not fade. Thee is no reason to return in a month.Manufacturers sell direct, refuse to profiteering. A kitchen gadget tool for many kitchen task. 1.Over the sink for drying dishes, cups, plates, bowls, tableware&cookware. 2.Over the sink for fruit and vegetable washing colander platform. 3.Over the sink for defrosting frozen food. 4.As a mat under hot pots & pans. 5.As a cooling rack for baked goods. Features:This is a multi-purpose product.It can be used over the sink for drying dishes, cups, plates, bowls, tableware&cookware, for fruit and vegetable washing colander platform, or for defrosting frozen food.It can also be used as a mat under hot pots & pans, as a cooling rack for baked goods.Roll up,when it do not use ,saving space in your kitchen. Latest version large size: 17-3/4″(L)×13-3/4″(W) It is suitable for most standard sinks, and it is better to confirm the size of the sink before purchasing. Material:It is made of 304 food grade stainless steel, rustproof, corrosion resistant and durable. Maintenance instruction:Easy to clean ,put this sink rack in your dishwasher or just flush it off under water faucet, then air drying. After-sales service: 5-year warranty period. 100% satisfaction guarantee. 100% worry-free guarantee.Contact us if you need any help.We will reply at the first time. Quick breads are some of the most versatile bakes that you can make. While banana bread may be the first one that comes to mind, you can use any combination of flavors to whip up a loaf that is just as suitable for brunch as it is for dessert. This Applesauce Citrus Bread is like a ray of sunshine on a cool winter day, made with applesauce, cinnamon and fresh citrus zest. I use unsweetened applesauce for this loaf, applesauce that doesn’t contain any chunks of apple. The chunks of apple in applesauce tend to be a bit too saucy (haha) to bake up well in a loaf like this, which has a relatively long baking time, so I recommend sticking to plainer applesauce if you can. The applesauce adds a lot of moisture to the loaf and a hint of apple flavor. Apple doesn’t have as dominant a flavor as, say, bananas or pumpkin do in quick breads and that allows the cinnamon and citrus in this particular loaf to really shine through. You might not think of combining cinnamon with lemon and orange zest, but the warm spice really compliments their bright citrus flavors by creating a bit of contrast in the loaf. The cinnamon also hints at the applesauce in the base of the recipe. I didn’t add any lemon or orange juice because you get plenty of flavor from the zest alone. One large lemon and one large orange should yield enough zest for this recipe. The bread has a warm cinnamon smell when it is baking in the oven, but you’ll start to smell the citrus as soon as you cut into the cooled loaf. In fact, you will likely be able to see small flecks of lemon and orange easily! It’s moist and, while the loaf is tender, it’s dense enough to cut easily into generous slices. I enjoy serving this bread toasted and topped with a bit of butter or lemon curd, but there are many ways to enjoy it and I’m sure you’ll find your own favorites once you give it a try! Preheat oven to 350F. Lightly grease a 9×5-inch loaf pan. In a large bowl, mix together mashed bananas, lemon zest, orange zest and sugar. Blend in egg, vegetable oil and vanilla extract until smooth and uniform. Stir in half of the flour mixture, followed by the milk. Stir in the remaining flour mixture and mix just until no streaks of dry ingredients remain. Pour into prepared pan. Bake for 50-55 minutes, or until a toothpick inserted into the center of the loaf comes out clean or with only a few moist crumbs attached. Allow loaf to cool in the pan for at least 15 minutes before turning it out and allowing it to cool completely on a wire rack. Makes 1 loaf; serves 10. The post Applesauce Citrus Bread appeared first on Baking Bites. Our lovely group in Khinalig, the most remote village in Azerbaijan. It took me long to write this post. I was away from blogging for so long that, honestly, I didn’t know where to begin. Sorry for being silent without any notice. Life happened in 2018, including many good things, such as my unique food and culture tours to the Caucasus, my birthplace. A crazy idea born in October of 2017 turned into a solid vision shortly afterwards, and came to fruition in July 2018, when I led my very first Food and Culture Tour to Azerbaijan and Georgia. 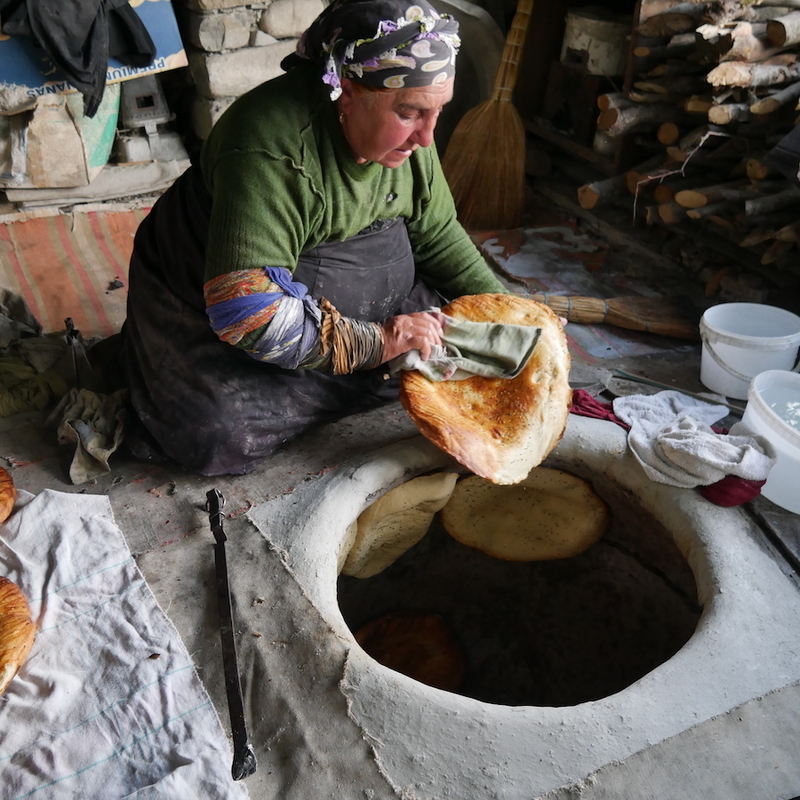 Baker Tila makes bread in her own tandoori oven in the remote village of Lahij, Azerbaijan. Needless to say, I was as ecstatic as I was a bit nervous – it was my first tour after all! It took me months to prepare and coordinate all the details of the trip – I needed to fully concentrate, hence my absence from here. The post Hello 2019 and New Food and Culture Tours to the Caucasus & Turkey appeared first on AZ Cookbook.